Let's face it: traveling with an infant can be tough, but that doesn't mean you can't enjoy a Walt Disney World vacation. With a little planning, your Disney trip can be a wonderful experience the whole family can enjoy. One of the hidden gems of WDW is the Baby Care Center. 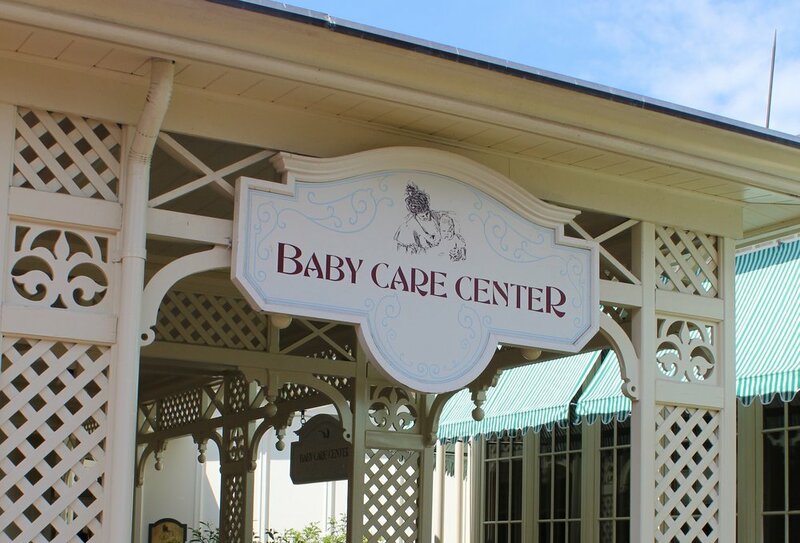 Located within each of the four Walt Disney World Parks is a staffed Baby Care Center available to you for no additional fee. When travelling to Disney with a two month old nursing infant, these rooms were a lifesaver! Why are these baby centers so awesome? 1) Private, quiet, dimly lit nursing with rocking chairs - comfortable for both mom and baby during feeding or for a little naptime 2) Changing tables - each station is equipped with several changing tables with pads and they are kept very clean by the staff 3) Quiet feeding areas - high chairs are included! 4) Kitchen with microwave, oven, and sink - great for warming up meals and formula - some of the staff even helped me with my dishes! 5) Main room with comfortable sofa, chairs, and a television - great place to just get away and relax with your little one without making a trip back to the resort 6) Mini-baby supply shop -Did you forget baby formula, diapers, food, other baby necessities, or an emergency change of clothing? You can purchase them here. Do note that the selection is not unlimited (Huggies diapers and wipes, Carnation formulas), so if you require a specific brand, it is better to plan ahead and pack your items. Where are the Baby Care Centers located? At the Magic Kingdom, you will find it tucked in a little courtyard behind the Crystal Palace Restaurant. The nursing room is a larger common room with several rockers; don't worry...it is private and the staff makes sure only nursing mothers are entering! The Baby Care Center at EPCOT is located in a building just before you enter the World Showcase (near Mexico). It is a little hidden, but conveniently located in the center of the park. Like the center at the Magic Kingdom, the nursing room is a private common room. At Hollywood Studios, you will find it located near the entrance of the park by guest services. The individual nursing rooms are small, private stalls separated by curtains. They reminded me of a large dressing room. Animal Kingdom houses the best Baby Care Center. It is located on the left side of the Tree of Life just before entering into Africa. The individual nursing rooms are small, but have a door, which helps keep the room extra quiet.